It was another mark of progress this morning when I wandered around the overcast garden while Jackie was out shopping. I didn’t imagine I might have to be rescued in some way. Wedding Day rose has begun to bloom on the Agriframes Arch spanning the Brick Path. The diagonal view from the Heligan Path towards the greenhouse features Hot Lips and the clematis now blooming over the Phantom Path. The arch over the Dead End Path, from which can be seen the Rosa Glauca in the patio, supports Compassion rose and scarlet runner beans. Astilbe and campanula Samantha flourish in the West Bed. Poppies, heucheras, and clematises vie with roses in the Rose Garden. 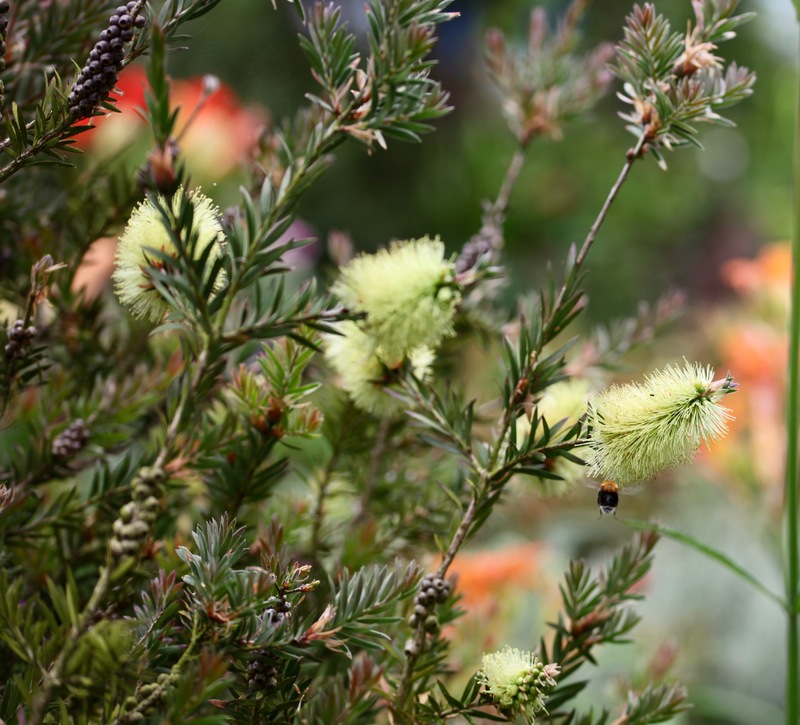 Here, a bee sets its sights on one of the yellow Bottle Brush plants’ blooms. The sun having put in an appearance this afternoon, and a hosta in the front garden having caught my eye, I ventured out again. 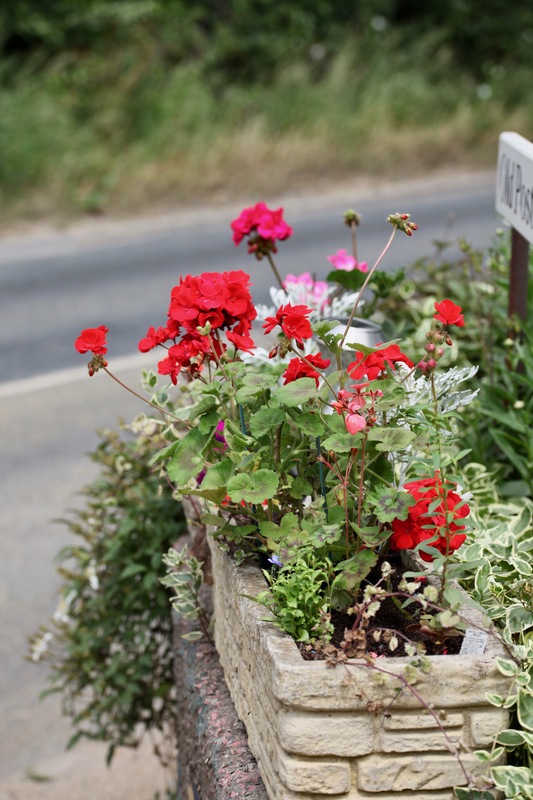 Jackie has replaced the pansies in the stone tubs on the wall with bright geraniums. 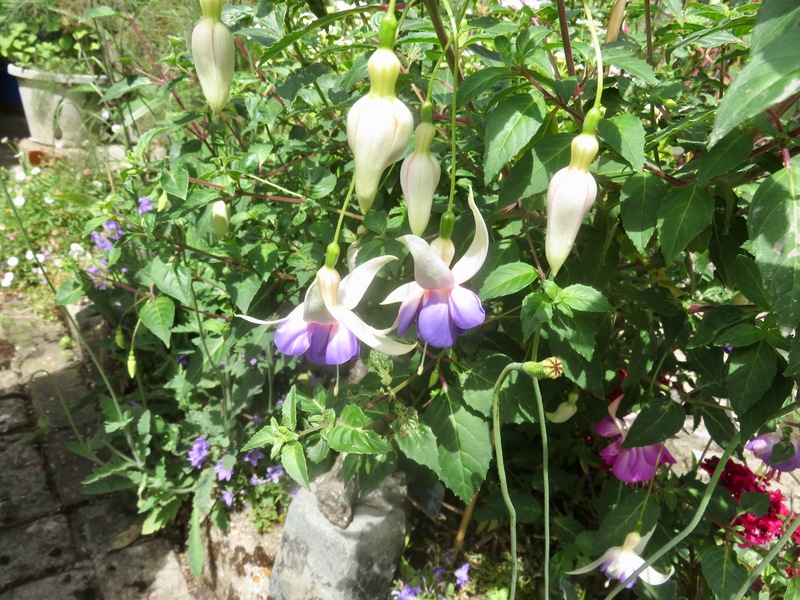 and these hanging baskets on the kitchen wall contain diascias, lobelia, and bidens. This evening we dined on our second helpings of yesterday’s Forest Tandoori takeaway meals. This entry was posted in Uncategorized and tagged astilbe, bidens, bottle brush plant, campanula Samantha, Compassion, diascias, erigeron, fuchsia Delta's Sarah, geraniums, hosta, Hot Chocolate, Hot Lips, Margaret Merril, runner beans, Wedding Day by derrickjknight. Bookmark the permalink. Jackie sure has a green thumb! Everything flourishing nicely! We’re going to have to put your house on a list for local tourists stops. How would you like to be tour guide, Derrick? I enjoyed the tour of your garden. Were you enjoying a hot chocolate while posting this? 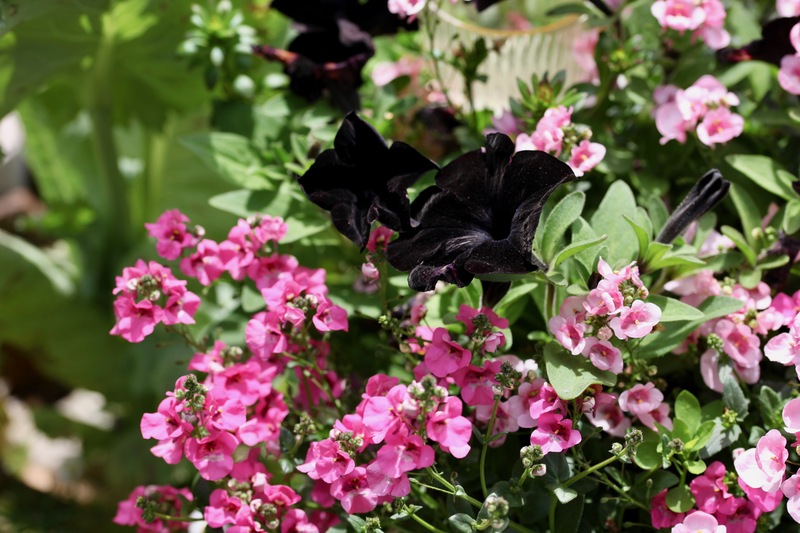 Those petunias are lovely, and do look black and velvety–I have never seen that before. Your runner beans are looking good. I haven’t even down mine yet! My goodness! 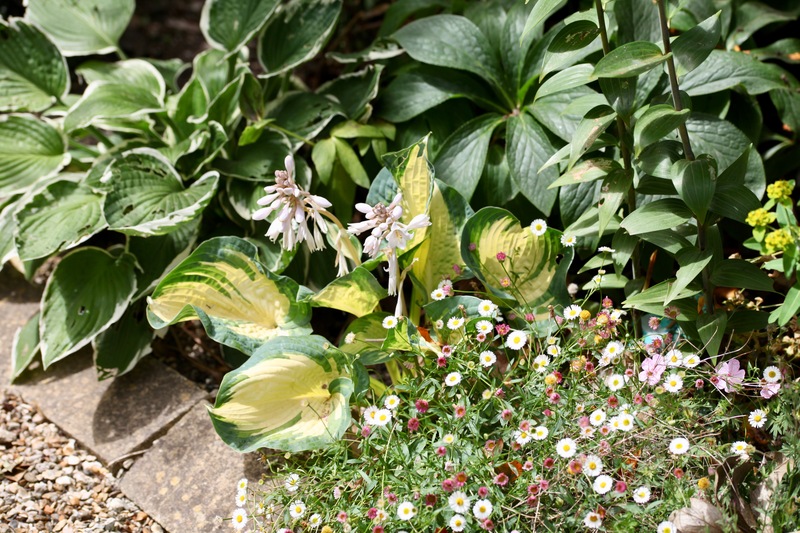 It may be overcast but these photos reveal a beautiful garden, one where a team of gardeners beaver away constantly in order to keep it in sterling condition. Jackie has done an unbelievably fabulous job in reshaping, reforming and nurturing this garden into a glorious park! How wonderful that you’re able to get out by yourself now, Derrick. The garden is fabulous. It looks so beautiful. All your garden looks lovely Derrick. Love the pic of the bee Derrick. You have a great eye. That’s a fat little bee you’ve featured half way down the post. A beauty. Everything looks beautiful, Derrick. I love the opening shot! Love your roses and the hanging plants….beautiful! some day I want to come sit and enjoy your gardens for myself. For now, I am enjoying the picture tours!! Thanks! Thank you! You have gotten me to 200 followers! I fully expected photographs that you’d taken of Loretta Swit. You certainly have a way of letting followers down; don’t you? Yes, but don’t let on to Derrick. That’s a lovely picture of the bee! Lovely garden, I especially like the geraniums in the stone pot! Give jackie a kiss from me for all this beauty!!!! My goodness, everything looks amazing – however long does it take to water that perfusion of colour?? I love your garden !! The roses are so beautiful! Lovely shots from every angle. Someone would have to get a team of horses to pull me away from your beautiful garden. Love it Derrick! Beautiful flowers Derrick, I am reminded of The Secret garden. Beautiful garden! The hanging baskets are looking very good. My ‘Hotlips’ sadly didn’t survive last winter.